9mobile is up with another new data plan on their network and is called "Special data offer". This data plan is mainly for those who prefer high volume of data at an affordable rate. Sometime ago, Etisalat know as 9mobile unveiled the data in the time of Ramadan Kareem - Muslims Celebration day, in order to celebrate the Muslims however, bring socialization. 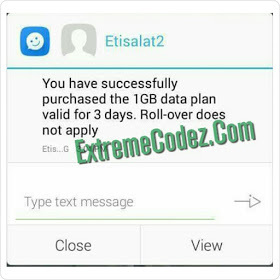 Moreover, this data plan was recently reviewed by 9mobile and has been turned official. With just N200, you are entitled to enjoy unstoppable access to the internet with the allocated 1GB data. It works on all devices including iOS, Android, BlackBerry and other devices that can access the internet. The data plan works for 3 days, stopping by 12pm in the night of the third day the plan was subscribed. Checking of social media notifications got easier with it. This offer is for all sim and it last for just 3days. Note this not a cheat or tweak it coming right from 9mobile below is the highlighted message sent by 9mobile regarding this offer; Special Data Offer! Get 1GB For 200naira And 5GB for 1000naira by dialling *929*10# valids for 3 days. This can be activated only when you subscribed five times making 5GB. This shows how the plan was reduced after five times subscription. it coming right from 9mobile below is the highlighted message sent by 9mobile regarding this offer; Special Data Offer! Get 1GB For 200naira And 5GB for 1000naira by dialling *929*10# valids for 3 days. Thiѕ website was... how do you saү it?